You have no idea how long I searched for this book. I can’t remember why but I was in Wellington library and this book caught my eye so I started reading it. It was pretty cool and stupidly I put it back on the shelf and just left it there. I didn’t memorise the name of the book, the author or anything. I only knew the plot. About a week later I was still thinking about this book so I started frantically googling the plot. It took me about a month to finally find the book. 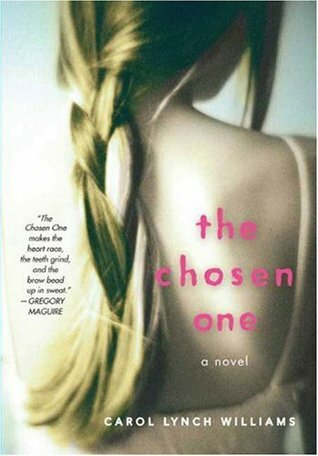 ‘The Chosen One’ is about a thirteen year old girl named Kyra who’s Dad has three wives and she has twenty brothers and sisters. Her and her family live in an isolated community ran by a prophet with extremely strict rules. Kyra has begun keeping secrets, including reading books even though every book except the bible is forbidden and meeting up with a boy named Joshua. She knows it’s only a matter of time before she’s caught. Then one day the prophet pays them a visit and tells her family Kyra will be the seventh wife to her sixty year old uncle. Now Kyra has to make a desperate decision. I’m going to get the whole ‘romance’ thing out of the way first because everyone knows that I don’t like romance. Okay, I didn’t love reading about Kyra and Joshua’s past, and all that part was pretty boring but in the present day they weren’t as irritating as I thought they’d be. Also, at least Kyra and Joshua’s relationship is necessary to push forward the plot. I can think of plenty of book romances that were just unnecessary. Kyra is a really interesting character who I really enjoyed reading about. It’s told from her point of view and I’m glad she was the main character. Obviously she’s not perfect – no decent character is. But I cared about her, I wanted her to get out, I didn’t want her to marry her uncle. Oh yeah, Carol Lynch Williams does a brilliant job of turning the uncle into a total creepy. He actually made me shudder a couple of times. Really made me emphasise with Kyra’s character all the more. I can probably say wholeheartedly that this was my favourite book this year. It came out in 2010 but I only just read it so it’s my book of the year I think. I would recommend this book to absolutely everyone – it’s like dystopian, heavily religious and just an amazing read. This review really doesn’t give the book justice. Just please read it?